Jazz is a cool word, isn't it? It describes a great style of American music, conveys being excited ("I was jazzed up to hear about your new job"), and can be used as a verb to show how to do something creatively ("he jazzed up his vintage automobile with a coat of paint and some spiffy detailing"). So, when the folks at the Zatarain's company asked if I'd like to review some samples of their gluten-free rice mixes, I was, in a word, jazzed. I love the spiciness and flavor combinations of New Orleans style cooking and was delighted to receive four boxes of various Zatarain's rice mixes to try out. With the smoky sounds of some Cassandra Wilson on my kitchen boom box to inspire me, I first tried out this easy supper recipe from the company's website: Seared Shrimp, Peas and Yellow Rice. Perfect! Everyone gobbled that down because we all love those three ingredients and I loved the ease of slapping it together on a softball-school concert week night. Next time I'll try it out with frozen shrimp, because I usually have a bag in the freezer for a quick meal. I used to buy bags of a different brand of Yellow Rice mix that my kids would love, but it contains wheaty ingredients so I haven't done so since we went gluten-free. But the new Zatarain's Yellow Rice mix is gluten-free, so that restores one more food that we all used to enjoy before the celiac diagnosis. The Jambalaya rice mix and Dirty Rice mixes are a bit spicier than the Yellow Rice, and I doctored them up further with a bit of garden cilantro, whizzed up into a slurry with some olive oil and coarse salt, and swirled throughout the rice. Delicious! 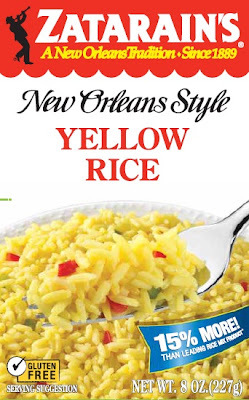 The Zatarain's Yellow Rice is sold for $1.29 for an 8 oz. box at my local supermarket and there's a bigger "family size" box as well, so it's an inexpensive start to a quick meal when you are pressed for time. I even made the Jambalaya Rice and Dirty Rice mixes in my rice cooker (they spluttered a bit, but it came out fine. As Roger Ebert notes, "the pot always knows"). I've since stocked up on Yellow Rice and Dirty Rice for our cupboard so I can whisk together a shortcut dinner during this hectic end-of-the-school-year. Do avoid the Red Beans and Rice, which contains wheat and barley, but many of the other varieties of the Zatarain's rice mixes - Jambalaya, Yellow Rice, Dirty Rice, Spanish Rice, Long Grain and Wild Rice - are gluten-free and should all be displaying a gluten-free label with a little check mark (see lower left corner on photo above) on your grocer's shelf as the old product sells and the new packages arrive. You can see the full list of the company's gluten-free products and some other jazzy recipes here. 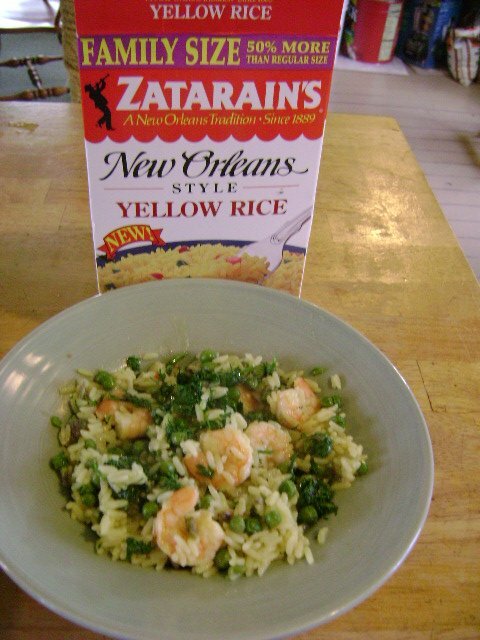 Overall, an enthusiastic thumbs up for these tasty products and a thank you to the Zatarain's company for adding the gluten-free labeling to their GF products. We all still need to double check labels to make sure foods are safe to eat, but it's nice to have another large food company reach out to the gluten-free community and retool its packaging to make it easier to shop for our dinners. I love this Yellow Rice. I usually eat it plain but this is a great recipe and I would love to try this.